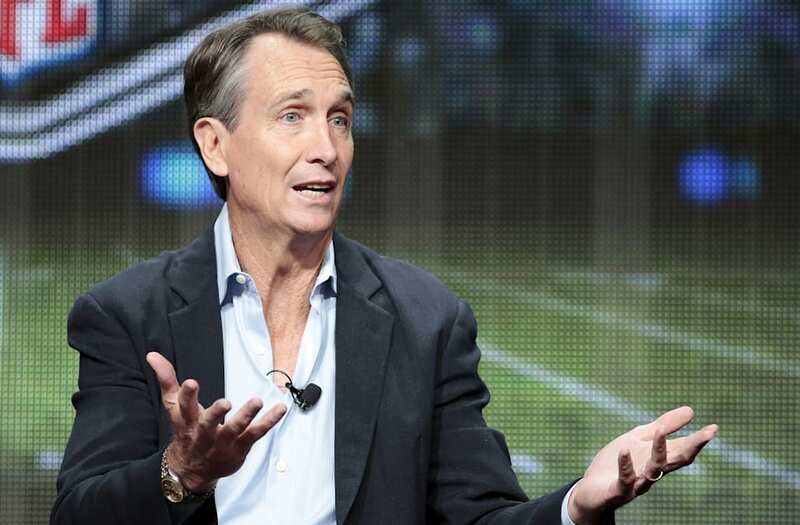 Cris Collinsworth is typically a very good NFL TV color commentator. Cris Collinsworth, however, had a pretty rough Super Bowl LII on Sunday night. Al Michaels’ partner on NBC particularly irked Eagles fans by expressing doubt as two Eagles touchdowns were reviewed, and incredulity after both were upheld. And Philadelphians, even after getting the Lombardi Trophy they’ve craved for decades, are still peeved about it. It then calls for NBC to “discipline” Collinsworth, or “at the very least” confine him to Patriot broadcasts. Eagles fans first took issue with Collinsworth after Corey Clement’s second-quarter touchdown catch. Clement got two feet in bounds in the back of the end zone, but couldn’t get a third in. The ball moved slightly in his arms, leading Patriots fans and Collinsworth to believe it should have been overturned and called incomplete. But, as Fox’s Dean Blandino explained, Clement never lost control of the ball, meaning the call should have been upheld. It was, but Collinsworth seemed baffled. That call was at least questionable, though. Collinsworth’s analysis during Zach Ertz’s game-winning touchdown was inexplicable. He had to have been the only neutral fan who thought Ertz’s TD catch might (or should) be overturned. On one hand, Eagles fans had a right to be annoyed during Sunday’s game. On the other, this is silly, and surely Philadelphians will forget their beef with Collinsworth when they’re surrounded by millions of their closest friends as parade busses stream down Broad Street on Thursday.